The Muscadet wine is one of the flagship appellations of the vineyards of the Loire Valley. White wine of the Loire, it is characterized by its pale yellow dress and by its dry character, all in suppleness. Originating from the wine-growing region of the Pays Nantais, Muscadet is a reflection of a very special terroir: the combination of a mild oceanic climate and a soil composed of the rocks of the Armorican massif. The Muscadet appellation actually includes several AOCs: Muscadet, Muscadet-sèvre-et-maine, Muscadet-coteaux-de-la-loire, Muscadet-côtes-de-grandlieu. The Muscadet white wines are all made from the Melon vine of Burgundy (named Muscadet in the vineyard). They derive a real freshness and characteristic lightness. The Muscadet white wine has earned its reputation thanks to its perfect harmony with oysters. It is true that the oceanic influence on the terroir and the proximity of the oyster farming areas encourage this regional gustatory grouping. 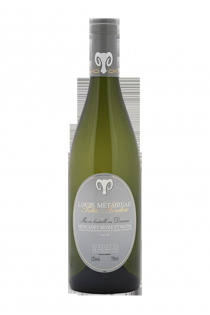 In general, the AOC Muscadet wines perfectly accompany fish, shellfish but also foie gras or white meats. Muscadet will also be appreciated as an aperitif: its freshness and its pearling aspect awaken the taste buds at the beginning of the meal. Often used in their youth, Muscadet wines sometimes have good potential for keeping: 5 years for the greatest vintages. They then gain in roundness and complexify their aromatic power. The Muscadet appellation of origin has the distinction of bearing the name of the vinified grape variety, without referring to the geographical region. Each sub-appellation brings a particularity to this white wine. The muscadet-coteaux-de-grandlieu are characterized by their very freshness, the Muscadet-coteaux-de-la-loire show a beautiful vivacity. Muscadet can sometimes be raised on lees. Left in contact with the yeasts for several months, this Muscadet on lees gains in richness and develops the bead that made its fame.